This is truly a dream come true! 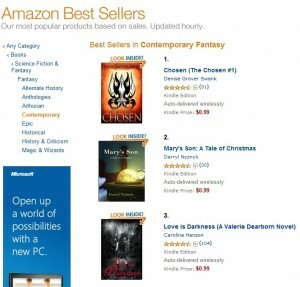 Chosen has been chasing the number one spot for over a week. Rankings change every hour, but I’m going to enjoy it as long as I can. And at the risk of sounding obnoxious, this isn’t just for the Kindle store. This is ALL contemporary fantasy books, print and Kindle combined. P.S. Hunted is STILL #1 in Hot New Releases on Amazon for both contemporary fantasy AND romantic suspense!